As a web developer, you need plenty of tools, for each function such as an Integrated Development Environment (IDE), Text Editor (For those who like pure-coding with no technical help), and local server environment such as WAMP or XAMPP for testing dynamic websites. In case, if you are an ASP.NET developer, of course, you need corresponding software as well. Even though you, as a developer, get familiar with this list of software, for a newbie, it is hard to keep an eye on all these applications for accomplishing single task at one time. Hence, it is, of course, a good option to get single application for doing all these jobs. At least not now, you do not have to approach Google for finding the best application in the category. Here, we would like to introduce Microsoft WebMatrix, an effective tool for managing all your web development projects. There is a bigger reason why we prefer this solution to you! It is the integration with Windows, as the software comes from the same tech giant. Microsoft introduced this lightweight tool back in 2010, but the newer version has more to offer along with the supported list including HTML5, PHP, ASP.NET, JS, JQuery and CSS3 etc. along with integration with famous cloud computing technologies. The supported-list simply means that the application can provide you a sophisticated development environment for your projects in trending technologies. Thank Microsoft! You do not have to get separate software for managing your projects that being developed in these languages. First, we can have a look onto this software. Before we start, let me mention that the tool is 100% Free and you can download the latest version, WebMatrix 3, from the Official Website. Simply saying, Microsoft WebMatrix works as a platform, where you can code, build, test and publish your web development projects that have been using technologies mentioned above. What makes the software different from other solutions is the ultra-simple but much useful user interface. Using the interface, you can simply create, edit and publish your websites, running on different CMS and platforms such as WordPress, Drupal etc. At the first look, WebMatrix 3 is a simple but great app in which you can install features one-by-one, according to your requirement. For instance, you do not need to install all available platforms, if you are concentrating on WordPress powered websites and blogs. In addition, when coming to the latest version, WebMatrix 3, you can observe enormous features, simplifying the process of creating and publishing your web-based projects with ease. Now, we will have a look on to top features of Microsoft WebMatrix 3 and will see how the software can help you in creating websites, using different but up-to-date technologies. Just because of the mentioned engagement, features offered and popularity, as a web developer, it is your duty to make your application convenient with cloud computing and its applied uses. In WebMatrix 3, you can feel a truly sophisticated approach to cloud, by means of Microsoft Azure, the leading product of Microsoft. For example, if you have created the desired website on WebMatrix platform, you can directly export it to your Azure portal and vice versa, without any clashes. In case of team-based works, you can save your works in your Azure server and access it from your personal or official computer, whenever required. Moreover, security of your completed works is also guaranteed! We guess, the feature would be much useful when you have to keep your work up-to-date. When compared to the premium-labelled products in the market, open source products are gaining much popularity and number of users accompanied by the enormous support by users. Hence, when planning to develop a website, there is no room for wondering if you have chosen WordPress over other paid ones. Understanding this fact, Microsoft has embedded the support for open source based web platforms and content management systems (CMS) in the software. This means that you can install these platforms in your local server environment via a bunch of clicks. Hence, no more stories of clashes when trying to install WAMP Server in a PC, already has IIS installed. List of Web Platforms you can use it in WebMatrix is as follows. In addition, you can get separate administration dashboards, for each extra Web Platform you install in the local server environment of WebMatrix. Moreover, you have more benefits when it comes to the coding section of each CMS or platform (say WordPress). You have a number of benefits when downloading a website to your PC too! The software will automatically detect the platform of that website and extract contents in a fully functional method. Then, you can access the website, just as you visit one WordPress blog or site. Along with the mentioned features, the software protects the core files of your CMS, so that you will not edit them accidentally. As you know, you need special codes for finishing each page of your WordPress. In that sense, WebMatrix can offer you 100% dedicated code auto-completion support. Once you have started typing the syntax, the software will suggest you appropriate auto-completions, which in turn helps you in quicker coding. By the way, don’t you need PHP and MySQL for running WordPress? What will you do then? This is the answer for the last question. You can use web platform installer (PI) for installing web platforms, required for your CMS or blogging platform. Actually, you have to use web platform installer for installing web apps as well. In the case of WordPress, as you know, your server needs PHP and MySQL to run. Currently, in WebMatrix, you can see none of these services installed and you have to install both of these platforms via Web PI. Web PI has such a superb UI, in which you can install each platform (MySQL server for example) in seconds. In addition, the Web Platform Installer consists of technologies such as IIS Web Server, .NET Framework, SQL Server 2008 Express, Visual Web Developer Express tools, Web Apps and some extra plug-ins such as PHP for Windows [trial version]. If you want to see your web project sustainable, you have to include some mobile-based features in it, so that the website can give equal performance, no matter the device of user. For improving the mentioned section, Microsoft has integrated some superb templates for mobile devices. Templates are available for languages such as JQuery Mobile, CSS3 and the famous HTML5. Using one of such templates, without the clumsiness of codes, you can create your mobile-friendly website or dynamic web application. 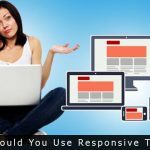 In addition, if you want to provide a dedicated version of your website to each device (PC, Phone or iPad), you have to thoroughly go through your website via each of these devices. 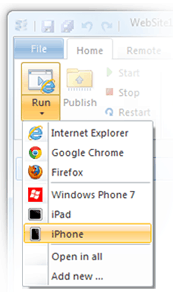 For improving that section, WebMatrix, by default, contains some device simulators such as Windows Phone, iPad, iPhone etc. We can hope that they will add more features soon. Thus, WebMatrix provides such a nice environment for mobile development when the auto-completion for JQuery Mobile is also concerned. Remote Site Editor: Why should you use another FTP client for maintaining your site, when WebMatrix can give you a combined solution? From the start page of WebMatrix, you can choose the option for opening remote website by giving appropriate credentials. 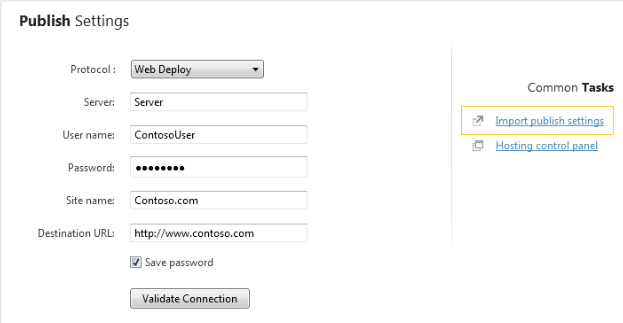 Once you have connected successfully, you can edit all your files, with features such as code auto-completion, just as you do in your local PC and update files in your web server too! The feature is quite awesome and you do not have to open additional software for editing and managing your website. Version Controlling with Git: In case of services that you update regularly, it is significant to keep track of all your versions. Microsoft makes use of Git, the famous service for purpose, for sharing your code and doing things easily with GitHub. Simple branching, easier interface of Git are also interesting features of WebMatrix 3. Recalling all, what we mentioned above, Microsoft WebMatrix is the best tool you can find in the web world for managing your projects, running on different languages and platforms. When compared to some premium rivals, WebMatrix itself is the best choice, as it is having the support of technology giant, Microsoft Corporation. You can get related details, download link, how-to tutorials and full-fledged support in the official WebMatrix page of Microsoft. Speaking technically, the software requires your PC to run on Windows 7 or later versions. Then, what are you waiting for? Just download WebMatrix and start simplifying your web development experience, never like before. Have you tried WebMatrix? Do let us know your opinion about Microsoft WebMatrix via comments. Yes.. web matrix is awesome. You need windows server to use this for publishing any website. Microsoft’s webmatrix 3 is such a great platform which is easy to access and build a cool professional websites. I totally agree to you that Webmatrix 3 is the best platform for making an easy CMS like wordpress, durpal, joomla and cakePHP. First time I’m seeing something about Webmatrix though. That’s probably due to the fact that I’m contented with Dreamweaver. But, with all what Abhijith had to say about Webmatrix, I think its something definitely worth checking out. At least a rain check. BTW, I’ve bookmarked Webmatrix download page for later use. Microsoft makes use of Git, the famous service for purpose, for sharing your code and doing things easily with GitHub. Simple branching, easier interface of Git are also interesting features of WebMatrix 3. Webmatrix is the best tool for developing your websites on windows platform. This is fast way to develop the website with security. 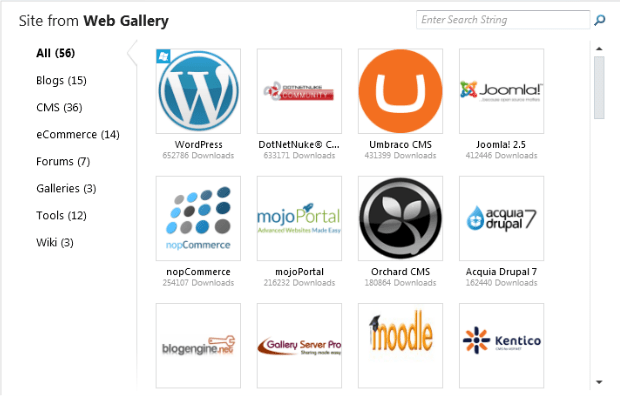 WebMatrix is using the wordpress, Joomla, Drupal, CakePHP, MediaWiki, Umbraco, nopCommerce web platforms. Every developer should read this blog to simplify the process of site building. Great article, thank you, my only concern with this is if it only accepts Windows based hosting then i dont think i will be able to use it everywhere. Thanks Abhijith for such a precise and elementary article. Web matrix is really awesome, it will be quite simple now to prepare different CMS like Joomla, drupal, magento etc. Microsoft always launched an innovative software products which are helpful to most of people and especially for web developers to develop a reliable web application. This web matrix is one of the best example of it. Windows phone app developers required a lot of tools for fulfill the clients requirement. I hope microsoft webmetrix help developers to manage all projects. How can I install Webmatrix on a server without Internet Connection? I’m going to develop an local intranet. The server does not have a connection to the web. Webmatrix without internet connection, while installing it requires internet to download setup files later internet connection is not required. That is the problem, due to Security Settings it is not allowed to put the server into the internet zone. Therefore my question, if it is possible to download the packages needed within another internet PC or if it is absolutely required to have the server online? Your post was excellent. Actually before reading your article I have no idea about Webmatrix 3 but after going though your post I want also try to Webmatrix 3. Thanks for sharing this amazing information with us though you post.